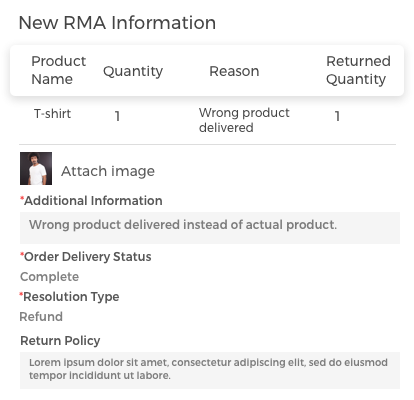 Product RMA: WordPress WooCommerce Product RMA (Return Merchandise Authorization) allows you to organize a system for customers to request a return without any efforts. With the help of this module, the customer can return the products, have them replaced or refunded within the admin specified time limit. The guest user can also generate RMA. The admin and the customer both can communicate regarding any query of the RMA. 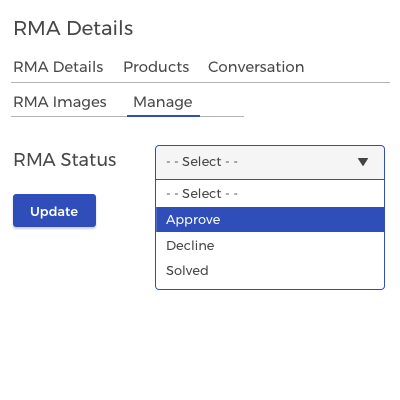 The admin can change RMA status - approve, decline and solved. The admin can create RMA reasons from which a customer can choose a valid reason. Email notification of RMA for the admin and the customer as well. The admin can also add a new shipping label. End-User satisfaction is very important for any business. By adding an RMA service to your store for the product will improve customer satisfaction. That’s why RMA is an essential feature of any functional e-commerce store. It provides the freedom to the customer to return and exchange the bought goods. The customers will be more confident while purchasing the product. It will create more transparency between the customers and the store owner. The admin can manage the RMA's from his panel and can configure the RMA accordingly. The admin can set the status of the RMA as enabled so that the customer can request an RMA to cancel/return/refund the product. The customer can request an RMA to cancel/return/refund a product and can select the RMA reason to generate an RMA. The customer can manage the requested RMA under RMA option. The admin can manage the RMA requested by the customer and can change the status of the RMA accordingly. If the customer wants to return a product then the admin can add new shipping label for the customer to return the product. Can set the RMA time for customers to generate an RMA. 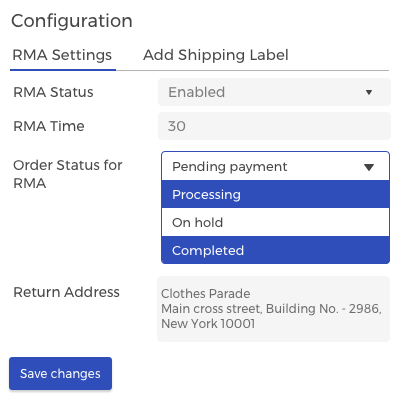 Can select the order statuses for which a customer can create an RMA. Can set the return address for the products. Can add shipping labels to be used while processing an RMA. The admin can set the RMA policy. The admin can create reasons so that the customer can add reason with the RMA. The customer can select the resolution type for an RMA. The customer can choose the reason for an RMA. The customer can attach an image to the RMA. The customer can message the admin on an RMA. The guest user can also generate an RMA. The customer can manage the requested RMA and can download the shipping label as well if the customer wants to return the product. The admin can change the status of an RMA request as approve/decline/resolved. The admin can view complete details of requested RMA. Both can view easily complete order details. The customer can put up a query for an RMA. The admin can revert to customer's query. 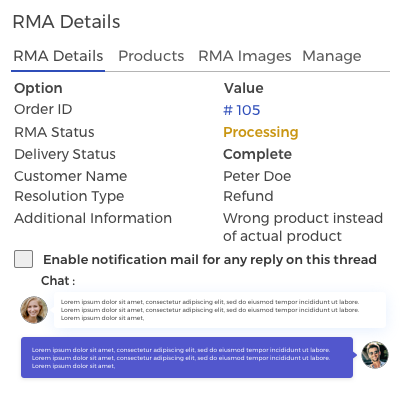 The customer and the admin both can view RMA details like - order id, RMA status, delivery status, resolution type, products, etc. Using Product RMA, the customer can cancel/return/exchange the products. The admin can set order status for RMA. The admin can manage the return policy. The buyer and the admin both can communicate at store end. The guest user also can generate an RMA request. The customer can choose the resolution type. The admin can set per product RMA time management. Provide shipping label upload option to Manage RMA page itself. Introduced mail notification for conversation. Supports multi-language feature added .pot file for translation. Did you buy Product RMA for WordPress WooCommerce? Support very fast and excellent. I really like the plugin and it's very useful! My problem was well documented but even so the support team helped very friendly. They even changed some CSS code so the plugin worked well with my theme. Does the WooCommerce Product Return RMA module allows the guest users to generate RMA request? Yes, the registered and the guest users both can generate RMA request. And for this, they have to provide order id & email address and the rest of the workflow is the same as for the registered customers. Can the admin configure time limit for a particular product to generate RMA? Yes, the admin can also set the time limit for a particular product to generate RMA. Can the customer specify desired return quantity while generating the RMA? Yes, the customer can return a specific number of products out of the total number of products he/she has placed an order for. Can the admin disable the reason for RMA once created? Yes, the admin can select created reasons and easily disable them. What is the major feature of the WooCommerce Product Return RMA? The WooCommerce Product Return RMA allows customers to put up a query related to the return to the admin. The admin can answer the queries of the customers.